The Point of Sale (POS) software is like the heart of your restaurant, efficiently organizing, managing and tracking the restaurant operations. Restaurant POS is no longer restricted to just printing out bills. The modern day POS is sophisticated yet robust software that takes care of your entire restaurant management. Features such as automatic billing, inventory management, reporting and analytics, central Customer Relationship Management (CRM) etc have simplified restaurant management like never before. 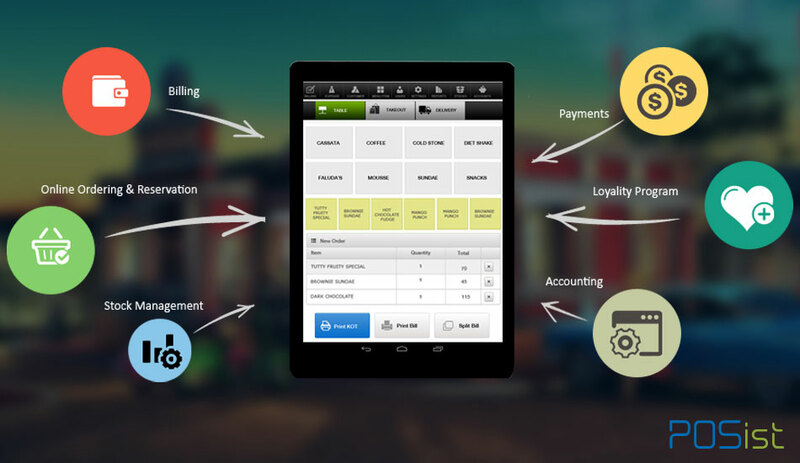 Read about the ways you be using your restaurant POS software other than just billing. Additionally, use this restaurant POS checklist that will act as a ready-reckoner to help you make the right decision. Fine dining- Since Fine-dining restaurants are all about providing the best customer experience to your patrons, the restaurant POS should have Table Billing to enable customers to order and pay right from their table. Also look for Table Reservations to spare your customers from waiting at rush hours. Split Billing is another great feature to generate separate bills on demand such as food and drinks. As you would want to engage with your customers more and more, look for an integrated Marketing Platform and Feedback Management to gather the reviews of your customers. Find out how you can make the best of your restaurant POS for your fine-dine restaurant here. (i) Quick Service Restaurant- Advanced delivery module for tracking home deliveries, SMS integration to keep the customers updated about their order, central kitchen management, and multi-store management to monitor the raw material usage and the overall circulation of food across outlets. (ii) Bakery- Advance booking feature including a reminder to ensure timely delivery, shelf life management to manage the perishable items in the bakery, customer birthday and anniversary reminders for increased customer engagement. (iii) Pub and Bar- Split bill feature to generate separate bills for food and drinks, Bar ordering to take orders at the bar itself, Happy Hours offer scheduling, strong stock management to keep a track on the liquor inventory. (iv) Sweet Shop- Automatic pricing of sweets, advance booking feature with detailed tracking, customized detailed bill, centralized billing of multiple outlets. (v) Pizza Outlet- Flexible menu ordering to allow customers to customize their own pizza, advanced delivery management for real-time updates. (vi) Food Court- In-depth card management for multiple food outlets, detailed transaction reporting all the food outlets. (vii) Food Cart- Real-time tracking and reports, cloud printing for generating bills, and easy billing options. (viii) Ice cream Shop- Advanced pilferage control module, shelf life management. (ix) Café- Instant KOT and bill generation, menu categorization as per most to least popular items, automated offer integration to generate offers and discounts. (x) Large Chain- Central menu management to maintain consistency across all outlets, enterprise reporting enabling complete control over multiple outlets. (i) Automatic billing- The bill is generated automatically as soon as the customer finishes dining. The bill is generated according to the Kitchen Order Ticket, thus eliminating the need for punching in the order again, and also any chances of order mix up. Read how restaurant billing improves operations and promotes enhanced customer service here. (ii) Stock & Inventory management- Inventory management keeps a track of the raw materials in the stock. The variance feature calculates how much ingredients have been used in a day, and how much should be actually available. This helps you keep pilferage and wastage of stock materials in check. (iii) Recipe management- Recipe management is an integral part of inventory management that keeps a track of how much raw materials have been used in preparing a single dish. (iv) In-depth reporting- Tracking and reporting are essential in running a restaurant business. Detailed reports of the total sales, total bills generated, total footfall in the restaurant, inventory reports etc, all need to be available for analysis. (v) Live Data Tracking- With live data tracking, you can stay updated on all the happenings of your restaurant real time. Cloud technology enables you to monitor your restaurant business real time. (vi) Mobile reporting- Mobile reporting allows you to view all the reports real time right on your mobile phone. Know more about the importance of Mobile Reporting in your restaurant here. (vii) Offline reporting- Offline reporting is a must-have feature in the POS, as it allows smooth functioning of your restaurant even in the case of internet outage. The POS would work efficiently offline as well and update the data as soon as the internet is connected again. (viii) CRM & Loyalty program Integration- Customer Relationship Management(CRM) is integral building and nurturing the relationship with your customers. An integrated CRM allows you easy access and management and customer data and allows you to customize and implement loyalty programs of your choice. The restaurant industry sees one of the highest attrition rates among all sectors. There is a lot of unskilled labor in a restaurant, especially at the junior level, one of which is the post of a cashier. The cashier’s post has an extremely high turnover rate. It is not feasible to use a complicated POS which requires skills and training, as, by the time the cashier has been trained to use the POS, he may already have decided to switch jobs. While looking for the best POS for your restaurant, choose a training free POS, which has a clean and simple User Interface, that can be used by anyone without any need for software training. Unsuspected glitches are bound to occur in the software, no matter how good it is. To keep up with the trends and new technology, your POS may also need to undergo upgradations. In such situations, you need to contact the Customer Support team, who guide you through the upgradations, glitches, or changes. The dynamic environment of a restaurant demands efficient and quick operations, and any delay can cost you both revenues as well as customers. Therefore, a helpful and prompt customer service team is a must. Look for references and reviews of the customer support of the company that develops the POS before you purchase it. After all, behind any successful product in the market, is a great Customer Service team. The food-tech industry has lately seen a huge progress in terms of new innovation. With new trends and growing customer demands, restaurants need to become increasingly tech savvy. A number of food tech services have cropped up to cater to this sudden surge. It is always advisable to use the POS of a company that keeps up with the industry trends and develop and add new features in the POS. In case your Restaurant POS does not provide them, at least choose the one that allows easy integration of such services. (i) Online Ordering- Online ordering has become the need of the hour. 70% of all delivery orders are placed online. Mobile ordering apps and websites can possess several handy features like customer profile, order history, feedback makes online ordering the easiest and most efficient way of boosting business and increasing customer engagement. Find out why Mobile Ordering Apps are becoming increasingly popular these days here. (ii) Online Payments- Virtual wallets are also become immensely popular, as people don’t like to carry cash with them. (iii) Online Table reservation- Online table reservations enable customers to experience a virtual tour of the restaurant, and then allow them to book a table of their choice, thus saving them the hassle of waiting, especially during rush hours. (iv) Table Billing- Table billing allows customers can order and pay directly from their table, thereby eliminating any manual intervention. The smoothness and efficiency of this process not only increases customer delight but also reduces human labor cost, and chances of error. (v) Integrated Feedback Management- Asking for customers’ feedback is no longer confined to giving them a feedback card that is hardly ever filled by the customers, or analyzed by the restaurateurs. Integrated feedback management allows you to present a feedback form in a tablet. The form is directly linked to the POS that allows item-wise reporting, and also allows you to set alerts in case of poor reviews. (vi) Restaurant Marketing- Taking Customer Relationship Management to the next level, restaurant marketing feature allows you to send bulk SMSs and emails to your customer base. Integrated with the Restaurant POS, this feature allows comprehensive customer data management . Did you find this article useful? If you have still have a doubt deciding the best restaurant POS for your restaurant or food business, schedule a free consultation with us today, and we’ll analyze your restaurant needs, and suggest the best for you! Very complete article, job well done! V. Nice and Helpful article, this time we are into pure veg Catering Business In Delhi. But we are thinking to move into restaurent business In Near future.